It was an evening of awareness and fighting the stigma against mental illness, as Vincent Piazza, star of an Emmy and Golden Globe winning series Boardwalk Empire hosted the National Alliance on Mental Illness-NYC Metro’s (NAMI-NYC Metro) annual “Seeds of Hope” gala in New York City. Approximately 500 supporters were in attendance which outnumbered the previous years’ events to date and the $300K was the highest ever raised for the many programs of NAMI-NYC Metro including its three psycho-education courses, peer-to-peer support groups and public education events that help thousands of New York City residents each year. 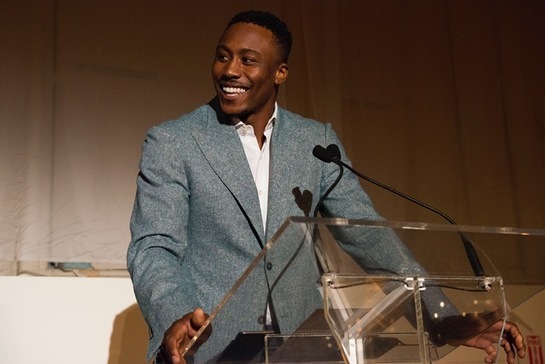 Those honored included First Lady of New York City, Chirlane McCray for her outstanding leadership and commitment to ensuring that mental health is treated with the same importance as physical health; New York Jets Wide Receiver Brandon Marshall received the #IWILLLISTEN Catalyst for Change Award for his work to spread awareness and understanding about mental illness and commitment to reduce stigma and lead others by encouraging them to seek care. Also honored at the gala was David Spanier, Esq., The Adele Anshien Volunteer of the Year and General Counsel at the Dextra Baldwin McGonagle Foundation for his years of service as a board member, providing legal guidance to NAMI-NYC Metro and as a Family-to-Family teacher. And lastly, Director of Healthy Minds at American Express, Charles Lattarulo was honored for his leadership in promoting mental health to American Express employees and their families through the #IWillListen global initiative for American Express employees. Marshall gave a heartfelt speech about what he has gone through in dealing with Borderline Personality Disorder, even being hospitalized for three months. His goals are the reduce stigma in not only football players and athletes, but those around the country who are too fearful to seek help. Other notable attendees included: Nathan Romano (Vice President of the Board of Directors), Barbara Ricci (President of the Board of Directors, NAMI-NYC Metro), and Dwight Hollier (NFL Director of Transition and Clinical Service) and Zach Grenier (The Good Wife).